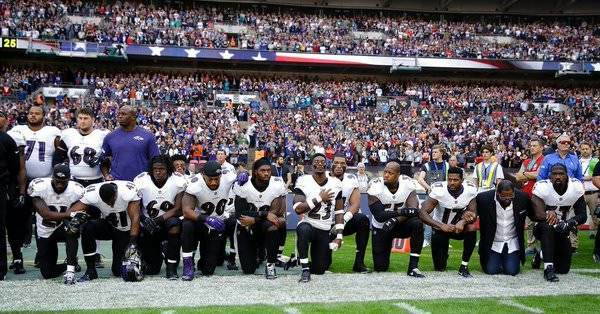 At least a dozen NFL players kneeled during the anthem before the London game today between the Baltimore Ravens and Jacksonville Jaguars. They did this in London. These same players who knelt during the national anthem stood for the British anthem ‘God Save the Queen’. Unreal. In London, those who were not kneeling, including the coaches on both teams and Jaguars owner Shahid Khan, locked arms during the national anthem at the game in London’s Wembley Stadium. Players taking a knee during the performance included Ravens linebacker Terrell Suggs and C.J. Mosley, wide receiver Mike Wallace and safety Lardarius Webb as well as Jaguars running back Leonard Fournette, linebacker Dante Fowler, defensive tackle Calais Campbell, defensive end Yannick Ngakoue and cornerback Jalen Ramsey. The players then stood up for “God Save the Queen,” the British anthem.